Erma la Fource - This method for the classic "Oscar" trick fools magicians and laymen alike. The magician makes a prediction: The Name of Your Card is Erma! The spectator names any card. He deals through the deck himself. Each card bears a different name on the back. There is only one "Erma" card. It is the card he named. Tamariz Rabbits - Michael Close's routine for Juan Tamariz' very commercial packet trick. Michael has eliminated the need to switch cards in your pocket, and has still retained the maximum number of changes. This is a wonderful trick for children. The Unreality Machine - Here is another strange Origami effect, involving an offbeat transposition between an origami snowball and a pack of matches. The climax looks like "morphing." 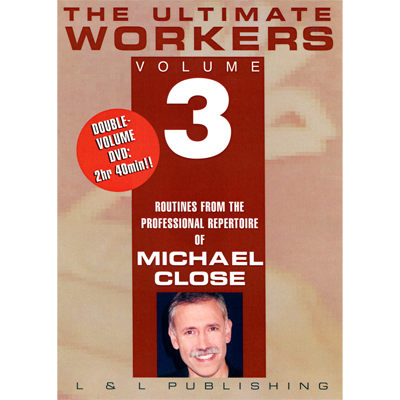 Close's Clones - A restaurant routine that provides enormous laughs with minimum work. This is a topical, funny, and very commercial routine. Down for the Count - Here's another funny routine that is simple to do. The magician proves beyond a shadow of a doubt that someone at the table is a vampire. The Card, the Forehead, and the Saltshaker - One of Michael Close's favorite routines, and a masterpiece of audience management, this is the first time that all the work has been explained on video. Audiences around the world have raved over this routine; now is your chance to learn all the details from Michael Close. Too Ahead - This three-phase coin routine is a fine example of diabolical routining. Done standing, it is perfect for table hopping. The subtle handling involved has fooled some of the best magicians in the world, and can be applied to other effects. Four-Card Reiteration - Dan Garrett's marvelous routine provides a lesson in expert card handling. Included is a discussion on palming, and Michael's utility move, The Last Card Push.